Review: You’d be entirely forgiven if you look askance at the arrival of the fifth entry in Disney’s impossibly lucrative Pirates of the Caribbean franchise. After making a huge splash in 2003 with their surprise hit based on the ever-popular theme park ride, Disney quickly plotted filming back-to-back installments to capitalize on the public’s Pirates-fever. Trouble was, these films made the unwise choice to focus less on furthering the story and more time on star Johnny Depp’s increasingly tedious portrayal of boozy Captain Jack Sparrow. Though Depp netted an Oscar nom for the first film, his subsequent appearances gave him a mile when he should have only been allowed an inch (or centimeter if we’re being honest). 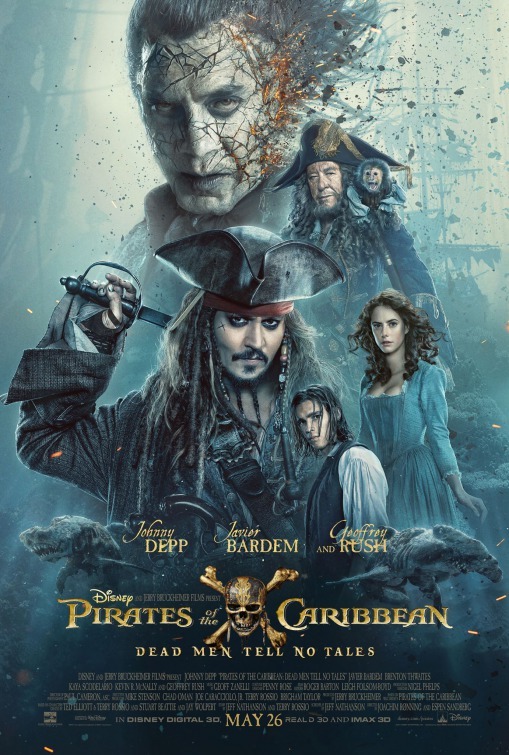 One last try at keeping the Pirates franchise alive was attempted in 2011 but it too got lost in a sea of Depp shenanigans and an over-reliance on CGI action sequences. Here we are in 2017 and while Dead Men Tell No Tales suffers from many of the same barnacles that sunk previous installments, directors Joachim Rønning and Espen Sandberg (Kon-Tiki) and screenwriter Jeff Nathanson have mostly reigned in their returning star while crafting a continuing tale on the high seas that’s more swashbuckling than shticky. If you’re behind on the Pirates films, some of what comes next would be considered spoilers but I’ll keep it as brief as possible. A long prologue introduces young Henry Turner, son of Will Turner (Orlando Bloom, Troy) and Elizabeth Swan (Keira Knightly, Jack Ryan: Shadow Recruit) as he makes a moonlight voyage to the bottom of the ocean in search of his father. Will’s been imprisoned by a curse on the ghost ship The Flying Dutchman, and his young son pledges to find Jack Sparrow and get his father back on dry land where he belongs. Flash forward nine years and Henry (Brenton Thwaites, Oculus) is laboring on a ship that runs afoul of a cursed vessel belonging to Captain Salazar (Javier Bardem, Skyfall) and his cleverly CGI-ed crew. Salazar also has an interest in finding Jack Sparrow seeing that he’s the one who cut his sailing days short in the first place and uses Henry to pass a message on to his old nemesis. Meanwhile, back in warmer climates Sparrow attempts to pull off a bank heist that provides the film with its first extended action sequence. Feeling like an old-School western that would have been filmed on a studio backlot, it’s a fun (if pointless) introduction back to Jack and his men with satisfyingly comedic results. It at least dovetails nicely into introducing Kayla Scodelario (The Maze Runner) as Carina, a plucky lass in trouble with the law on suspicion of being a witch. Turns out she’s just a bookworm with a penchant for telling anyone trying to man-splain something to her where to shove it and she’s got the same pluck Knightly exhibited in the original film. Getting into how Henry, Jack, and Carina end up back on the Black Pearl with Captain Barbosa (Geoffrey Rush, Minions, letting the costume do most of the work for him) searching for the trident of Poseidon could occupy several pages and I have a deadline to make so just take my word for it that Nathanson doesn’t have to push too hard to intertwine the end goals of these three castaways. It’s a fantasy film with little to no need for a ton of explanation. Without question this entry is the second most enjoyable one to date. It’s the shortest one of the bunch and uses its time and talents wisely without working bits down to the nub. Depp (Dark Shadows) may not look rejuvenated but it feels like he actually showed up for this outing. While Thwaites and Scodelario give spunky performances the two lack the kind of romantic chemistry the film desperately wants them to have. Coming off more like squabbling siblings they both fare far better when they get to make some headway with their own story. Rush is getting a bit on the campy side by now but the way he seems to relish drilling down into his pirate brogue is at the very least amusing. I always get a kick out of Bardem’s take on villainous characters because somehow he manages to find the humanity below the hate and isn’t afraid to go to weird places to get there. Most of his dialogue is purely expositional but he chews on his words as hard as he chews on the scenery as a once honorable man trying to rid the world of Pirates who now haunts the seas as a vengeful fright searching for Jack Sparrow (or, as Salazar would say, ‘Jah Spah-ro’. Rønning and Espen keep things moving at a good pace and stage their big special effects sequences with some interesting flair. A mid-movie chase by three zombie sharks could have gone SyFy Movie Channel wrong but wind up providing a few decent thrills matched up with seamless CGI. My only complaint is that so much of the movie is staged in dark environments that you wind up losing the location details and it becomes just another overly CGI imagined world. At the screening I attended, the 3D was askew which likely added to the visual fatigue but I’m sure had the effect been working properly more depth would have been added into the mix. On two recent trips to Disney World, I had more fun waiting in line for the Pirates of the Caribbean ride than I did at any of the previous three films. Aside from the original, Dead Men Tell No Tales is a marked improvement in the Pirates series and if a post-credit stinger is any indication, Disney is hoping audiences get their sea legs again and demand more skull and crossbones fun. As long as Depp is kept at bay and more focus is put on the lore behind any adventure embarked upon, I’d be willing to get my feet wet.